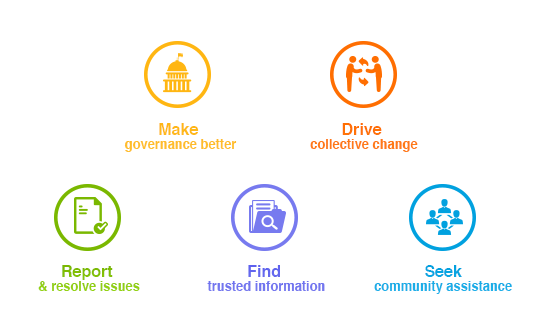 Swachh Bharat Online Citizen Communities were initiated in October 2014 by LocalCircles (www.localcircles.com) and Swachh Bharat Mission, Ministry of Urban Development in October, 2014. Since then, over a period of 12 months, over 335,000 citizens have become part of the various Swachh Bharat citizen communities across more than 100 cities of India. The National Community called “Swachh Bharat” enables Swachh Bharat Mission to easily seek collective citizen inputs on various aspects of Swachh Bharat policy and state of things in real time. Based on collective citizen inputs, over 50 whitepapers/checklists have been generated in the last one year. These cover subjects like Municipal Reforms to Civic Sense Basics for every Indian, engaging citizens in every aspect of Swachh Bharat policy making. In addition to the Swachh Bharat National Circle, over 100 city level Swachh Bharat online communities have been initiated in the last 6 months, bringing citizens together at a local level for discussion, collective on the ground cleanliness action and with the objective of collective citizen engagement with the urban local bodies in these cities. The enclosed survey on one year of Swachh Bharat was conducted in the Swachh Bharat National Circle to gauge the impact and performance of Swachh Bharat in a transparent manner. The objective was to understand what’s working and where efforts need to be put in going forward. On an average, over 30,000 citizens participated in each poll with over 50,000 citizens participating in a few polls, thereby providing a very large sample size. The sample makes it the largest poll done in the history of civic issues engagement. The biggest positive achieved in one year of Swachh Bharat has been the change of attitude and civic sense orientation of kids with over 51% respondents confirming it. The biggest negative has been the lack of engagement of urban local bodies. Over 72% of the respondents suggesting that their municipality is not engaged citizens for cleanliness activities/civic sense awareness. Almost 13% believe that the availability of public toilets has improved in their city. Overall, 21% of the citizens believe that their city has become cleaner in the last one year as a result of Swachh Bharat Mission. This is more than 1/5th of the citizens and shows that the Mission has had an impact. A key issue identified by citizens is the involvement of municipalities in Swachh Bharat Mission and engaging citizens in the same. 95% of the respondents believe that it is critical for the city/municipal leadership to engage with citizens on this mission. In addition, 94% of the citizens’ say, that their municipality needs a major upgrade on all fronts including skills, processes, systems, equipment, people and leadership. The community also believes that the Swachh Bharat Ambassadors have been under-utilized in the first year. With over 82% respondents suggesting that the ambassadors can be a local node that can motivate citizens and municipalities to work together. Also, 87% of the respondents believe that a city’s ability to deliver on Swachh Bharat milestones should be a critical requirement before any smart city funds are released to the city. 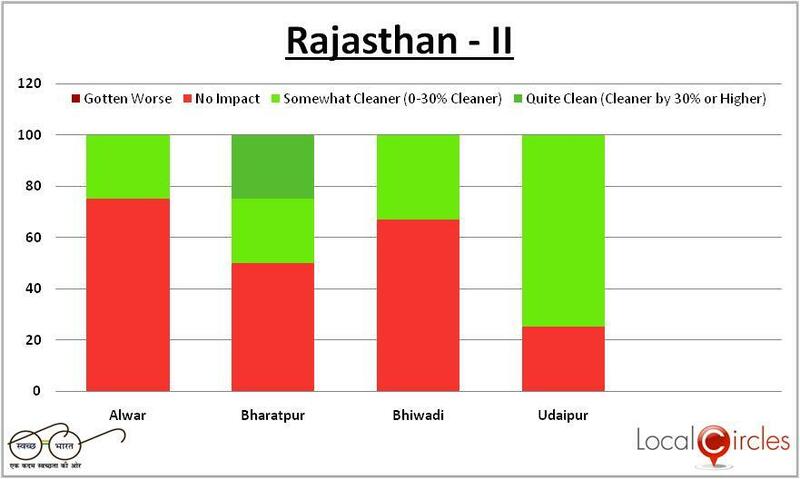 Seven states have shown a visible improvement in the level of cleanliness based on the feedback from the citizens. 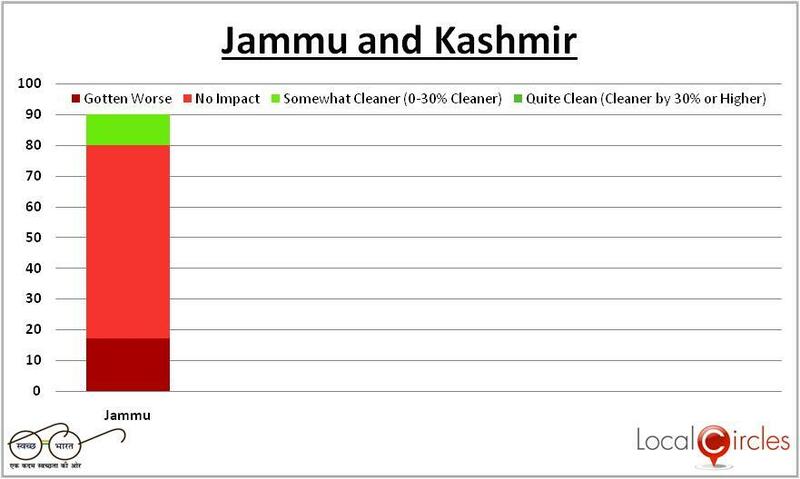 Majority of the states have shown marginal improvement in cleanliness. The feedback from the North-East States was limited due to lack of city level Swachh Bharat circles there. Gujarat, Chattisgarh, Andhra Pradesh, Punjab, Karnataka and Himachal Pradesh have shown visible improvement, according to citizens. Some of the states have shown visible improvements in their capital cities but their overall ranking has fallen as other cities in the state have performed poorly. Marginal improvement includes states that have shown zero improvement too. The absence of some of the most populous states like Uttar Pradesh, Bihar, Delhi and Haryana in the visible improvement list means that a lot of work still has to be done. A second round of research at city level needs to be done to find why the urban local bodies in cities of these states are not able to implement Swachh Bharat Mission effectively. The poll in Andhra Pradesh was carried out in five cities, after the bifurcation of the state and Telangana being carved out this is the first poll of citizens in the state. 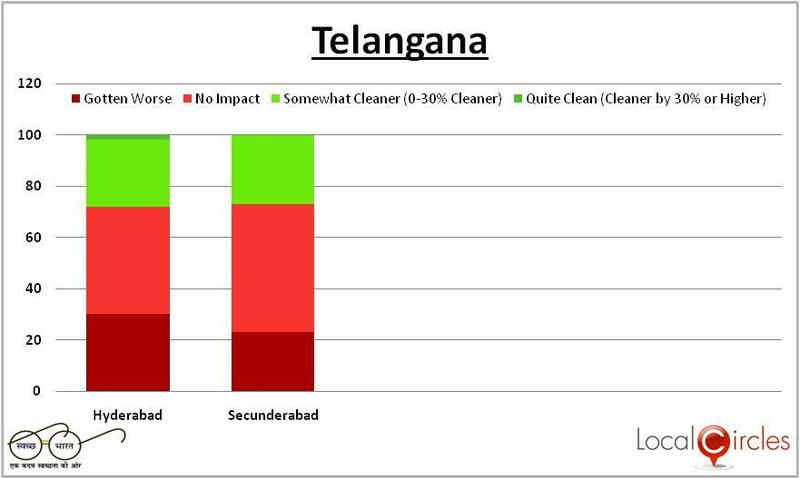 Guntur, Nellore and Vishakhapatnam citizens see marginal improvement in the cleanliness in their city. Rajahmundry and Vijaywada citizens voted overwhelmingly in favour of visible improvement in their cities. 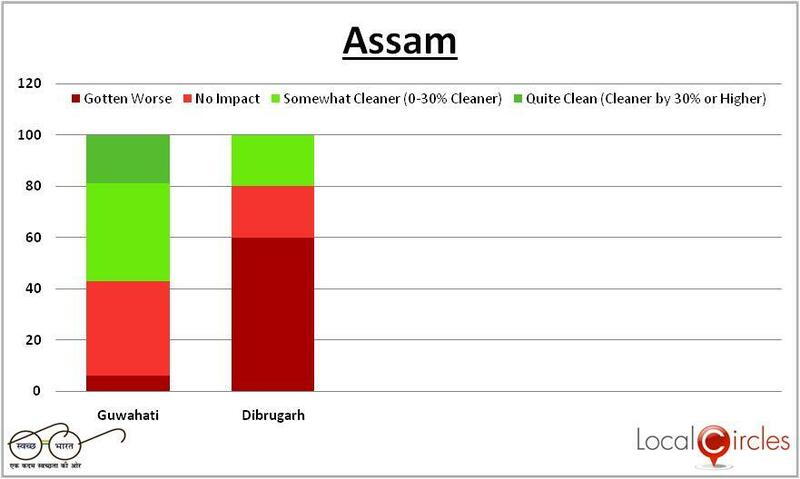 The poll in the state of Assam, the only North Eastern state that the survey covered had respondents from two cities. While the capital city Guwahati citizens say that the Mission has had an impact on the city, Dibrugarh citizens felt otherwise. This is trend across the states where the citizens of the capital city say that the mission has made their city cleaner. The general perception of the populous state of Bihar is that it is poor in civic amenities, and it is borne out by the citizens. 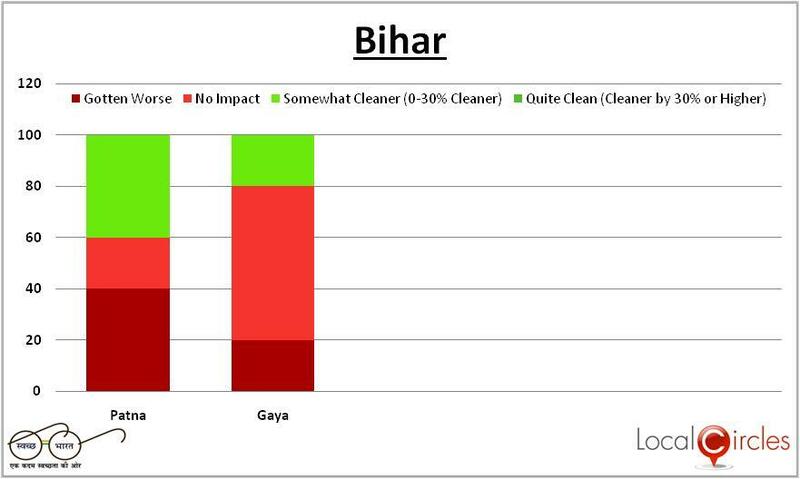 Even in the capital city Patna, 60 % of the citizens do not see any improvement in cleanliness and it is higher for Gaya at 80%. 40% of citizens in Patna felt the city has gotten worse in the last year while 20% of Gaya residents felt the same. 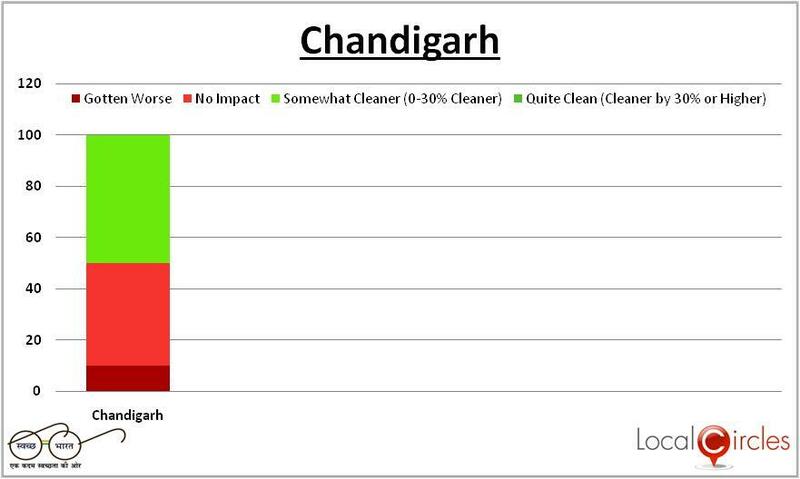 As a capital of two states Punjab and Haryana and also a union territory, the citizens of Chandigarh are almost equally divided in their opinion of the impact of Swacch Bharat. Approximately 50% of the citizens felt that the city is now cleaner as compared to last year. As a modern city it does not have the same level of challenge as other cities. The city has a better civic sense than many other cities in the North, has an highly educated citizen force, and fairly reliable civic services. 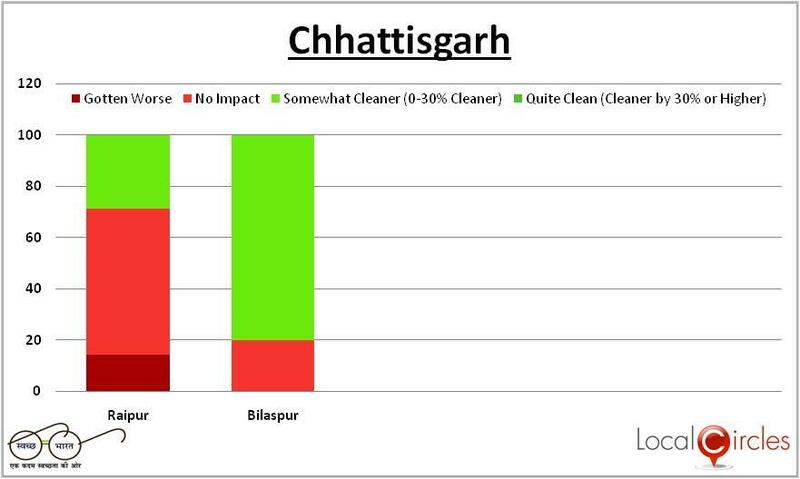 Chattisgarh is possible the only state where the capital city Raipur underperforms while Bilaspur does exceedingly well. Though, the overall ranking of the state is good and it shows visible improvement it is because 80 % citizens of Bilaspur feel there is an improvement. The poll in Delhi covered all the 7 constituencies of Delhi and as an aggregate the improvement observed in Delhi is marginal at best. The capital of the country is currently witnessing an outbreak of dengue, has the most polluted air in the world and comes to a standstill during monsoon season due to bad waterlogging. Going forward, effective delivery of Swachh Bharat from the civic bodies is extremely critical to make Delhi cleaner and healthier. 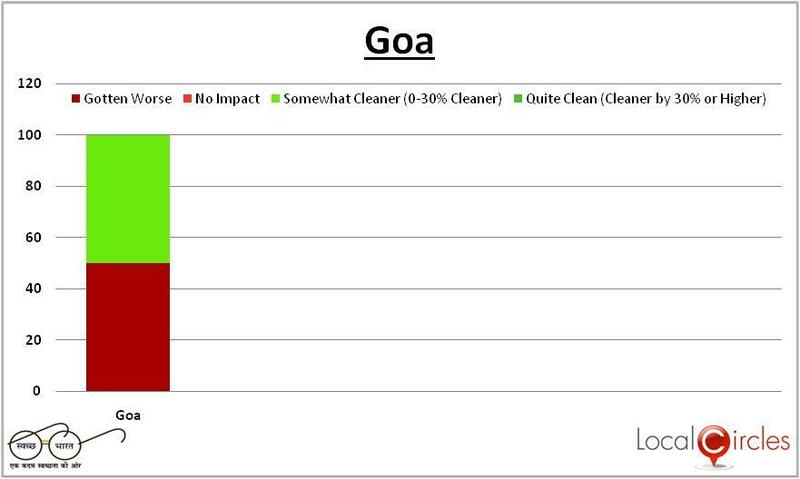 The survey results for citizens in various cities of Goa have been clubbed together as it is relatively a small state. The importance of cleanliness in the state that derives bulk of its revenues from tourists cannot be over-emphasised. The state does not make the cut in showing visible improvement as the performance of Swachh Bharat has not shown a visible improvement according to citizens. Seven cities were covered in the survey in Gujarat that made the cut as a state. Gujarat has always been better at handling civic issues particularly cities like Ahmedabad. It is one of the few cities that handled issues like BRT and public transportation well. It shows up in the implementation of the Swacch Bharat Mission too. The jarring note is that while Ahmedabad scores high the administrative capital of the state Gandhinagar trails in performance with 33 per cent citizen saying has gotten worse. This is an anomaly in the otherwise stellar performance of the state. Surat citizens also say that there has been no change but the city has a stellar record of sanitation and has focused on it since the plague epidemic. In the case of Surat 73 per cent of the citizen say that the mission has had no impact. 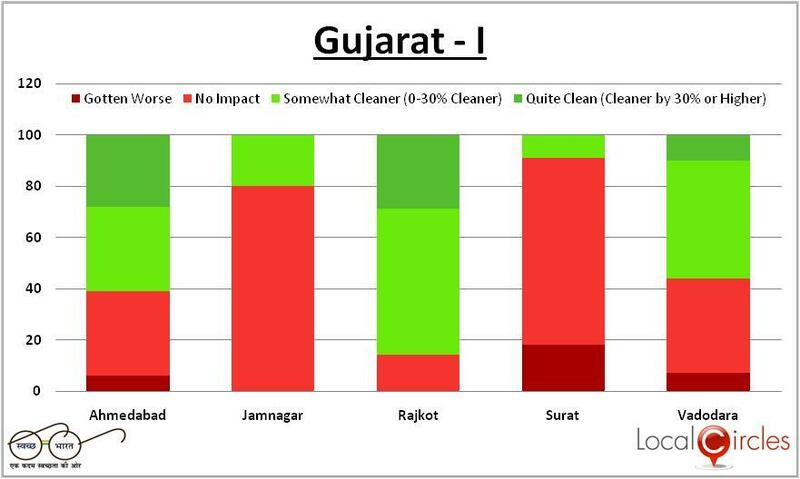 Jamnagar and Anand are more of worries with 60 % to 80 % citizen saying no impact while citizens in Vadodara and Rajkot have voted for visible improvement in their cities. Two important cities in Haryana were covered for the survey, they are important cities as they contribute the bulk of GSDP of the state. Gurgaon is the global services hub of the state and is on the global offshore industry map. Faridabad on the other hand is an industrial town but it shows a better impact with 28 per cent citizen saying it somewhat cleaner while 7 per cent say it quite clean. 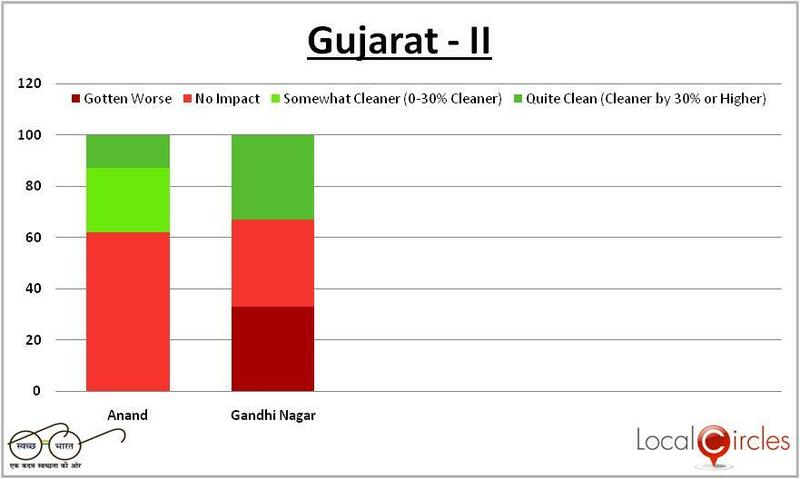 Gurgaon on the other hand only 24 per cent citizen say has become somewhat cleaner due to Swacch Bharat Mission. Panchkula which is on the border of capital city Chandigarh has the most dissatisfied citizen with 40 % saying the city has become worse. 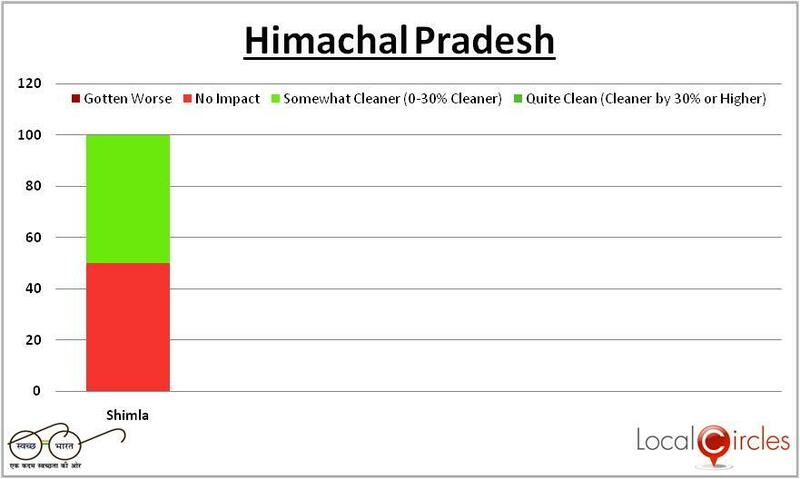 In Himachal Pradesh the capital city and the seat of the government was covered in the survey. 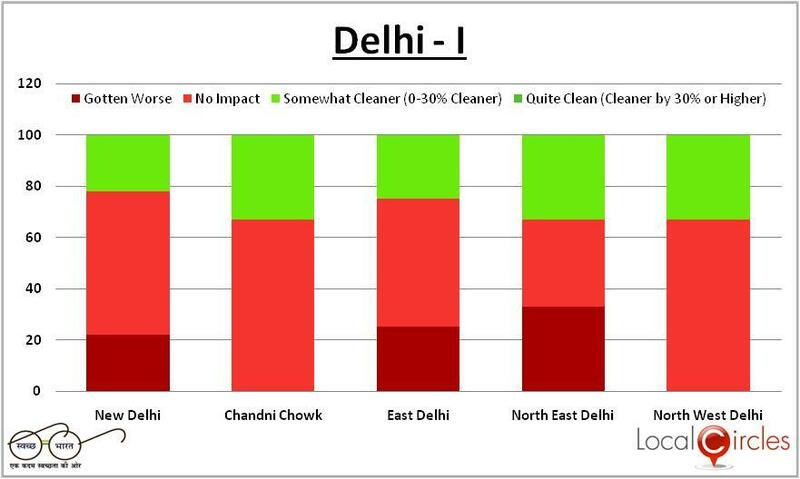 Around 50% of the citizen said that the city is somewhat cleaner after the Swacch Bharat Mission. Though only one city could be covered in the state its results have not been extrapolated to reflect the full picture of the state. The status of the mission in other cities of this hilly state is not known. Typically capital cities have tended to perform well for most states given the location of the Government there. Jammu and Kashmir had one city Jammu as part of the survey. The city has been growing rapidly over the years due to immigration from rest of the state. Several colonies have come up and the overall state of civic infrastructure is poor. This is reflected in the survey with 27 % of the citizens saying that the cleanliness has actually got worse over the last one year. 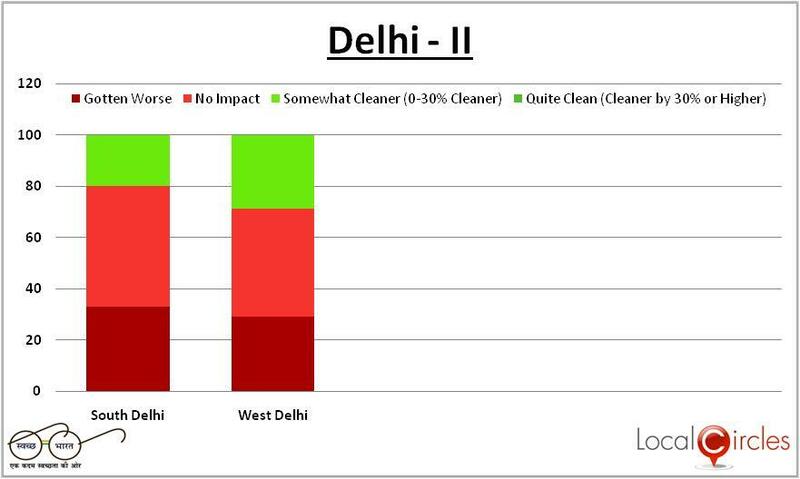 And 63% saying that the mission has had no impact on cleanliness in the city. 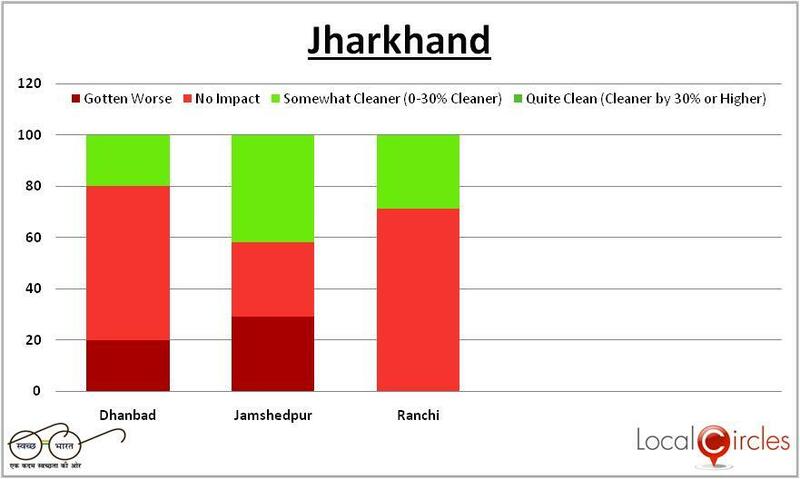 Three cities in the state of Jharkhand were covered while capital city Ranchi was a borderline case with 29 % citizen saying that the mission has helped cleanliness in the city. The industrial town was a surprising high performer with 42 % of the citizen saying that the city is somewhat cleaner. Jamshedpur is an industrial township with an anchor in Tata steel and the company has spent enormous efforts in the city. Therefore it might be a learning that an industrial city if it has the right anchor in a corporate is likely do better than other. Dhanbad another city that lies in the coal belt of the state has only 20 % citizen saying that the situation has improved. 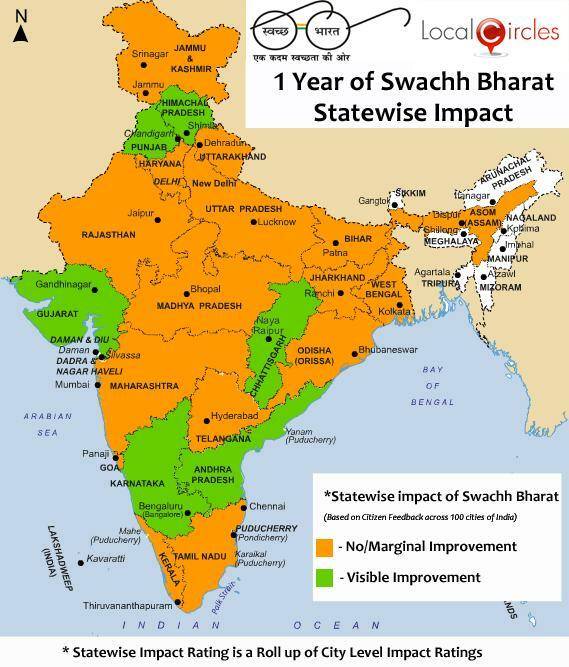 Among all the states Karnataka is a stellar example of almost every city in the state showing citizens have benefited from the Swacch Bharat mission. 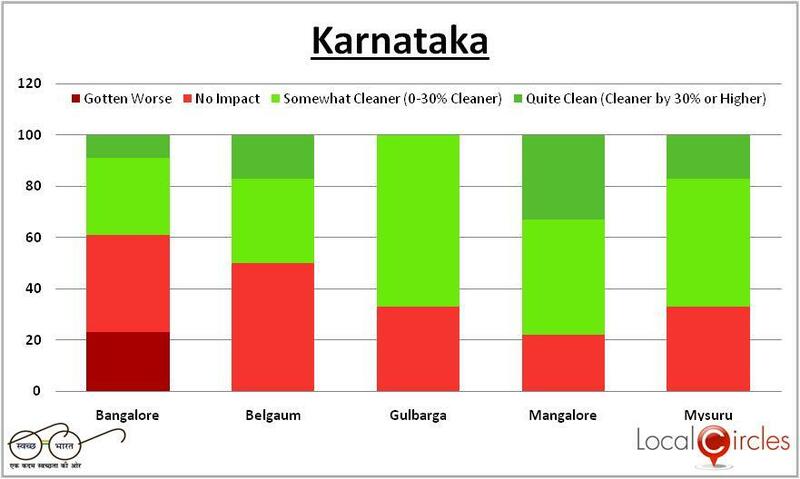 Large metropolis city like Bangalore that has several challenges has 39 % citizen saying cleanliness has improved or become somewhat better. This is an encouraging sign. Smaller cities like Belgaum, Mysuru, Mangalore and Gulbarga show even much better results though the sample size in these cities is much smaller as compared to Bangalore. An overwhelming 65 % to 80 % citizens in these four cities claim that Swacch Bharat Mission has been successful in improving the cleanliness in their cities. The state needs to be applauded for implementing a central scheme and municipal corporations in these cities need to be cited for their excellent work. 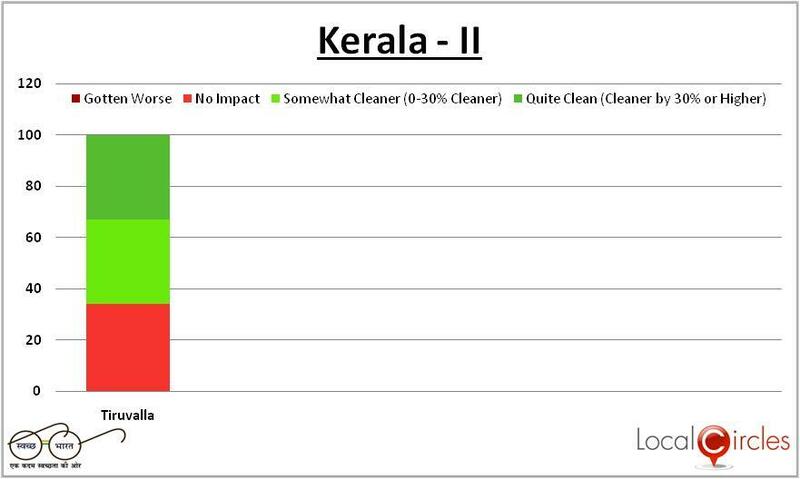 Kerala throws up contrasting examples some very good performing cities and some not so good. Smaller cities like Tiruvalla, Kozhikhode and Thiruvantharam citizen say that the Mission has made the city somewhat cleaner or quite clean. This is a state with high literacy levels and high disposable income so is expected to be higher on the awareness factor when it comes to civic issues. 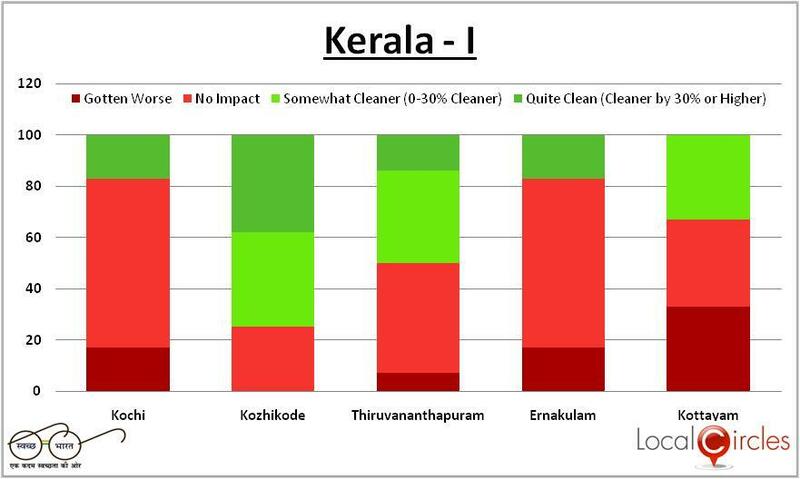 Kozhikhode stands out in all cities with a very high percentage of 75 % citizens saying that the city is somewhat cleaner or quite clean. Citizens of Kozhikhode have set a record by voting their citizen highest among all cities in terms of its performance on the Swacch Bharat Mission. Madhya Pradesh follows pattern of other states with the capital city Bhopal outperforming as compared to all the other cities in the state. Though a capital city Bhopal is relatively smaller than Indore in population but 46 % citizens of Bhopal say that the city is somewhat cleaner after one year of Swacch Bharat. Indore on the other hand is more of an industrial city and has 27 per cent citizen saying that the city is somewhat cleaner. While Gwalior score poorly with just 17 % voting positively. Ujjain on the other hand has been shortlisted as a smart city and a religious one with a large tourist population has 25 % citizen saying that the city is somewhat cleaner. 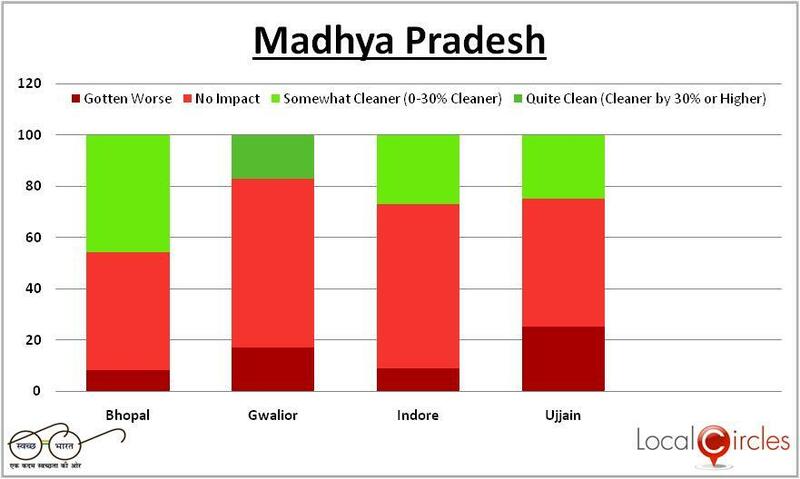 Overall, Madhya Pradesh has shown marginal improvement in cleanliness according to citizens with Bhopal being the only city showing visible improvement. Six cities in the state of Maharashtra were covered in the survey. The big surprise is Nagpur city in the state that has 15 % citizens saying that the city is quite clean due to Swacch Bharat. And another 57 % saying that it has become somewhat cleaner. Nagpur is emerging as a city and several IT and BPO companies have set up base in the city due to it being in education hub. The suburb of Mumbai Thane has piped Mumbai with almost 50 % citizen there saying that the city has benefited somewhat or quite in cleanliness as a result of Swacch Bharat. The challenge in Mumbai continues with a burgeoning population but with the richest municipality in the country. Only 11 % citizens say that the city is visibly clean while another 25% citizens say that the city has somewhat cleaner over the last year. As the financial capital and the first base for foreign investors Mumbai clearly needs to do better. And maybe can take a leaf out of how Nagpur has been able to do such a stellar job. 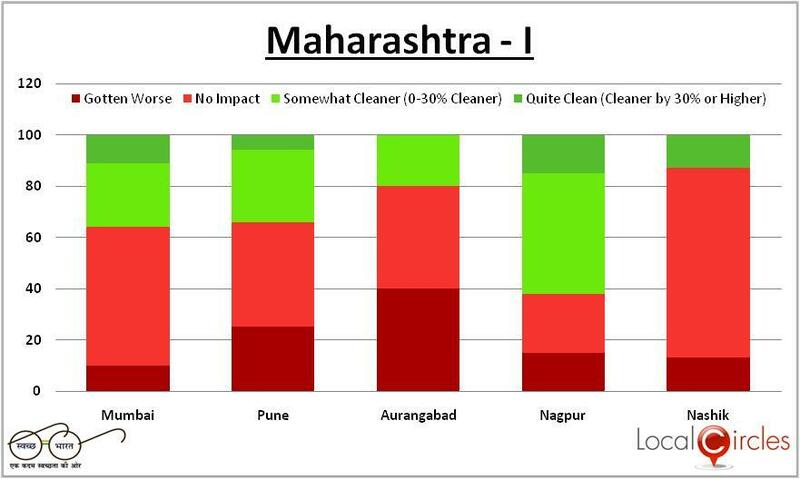 Nashik and Aurangabad cities bring down the overall performance of the state with bulk of the citizens dissatisfied with the performance of the Swacch Bharat. Bhubaneshwar is the bright spot in Odisha with 27 % citizens saying that the city has become quite clean after Swacch Bharat Mission. And another 36 % of the citizen saying that it is somewhat cleaner. This is a combined 63 % citizen saying that the city has benefited in sanitation from the Swacch Bharat mission. But as a capital city and the seat of the government it was expected to do well. 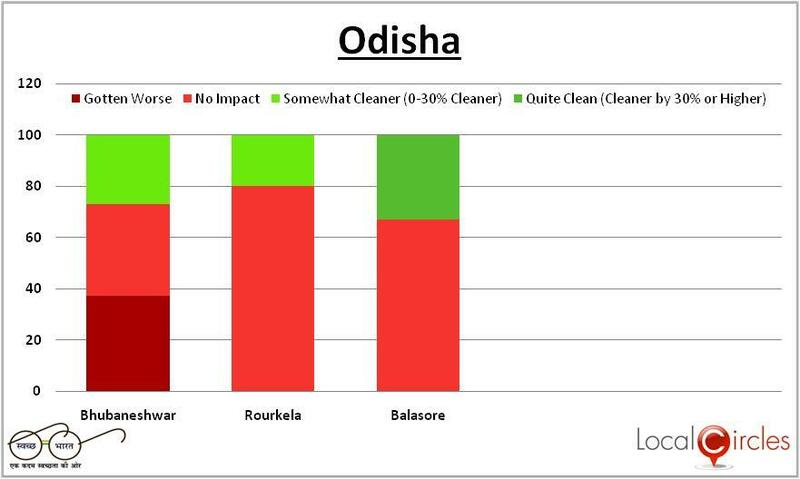 Rourkela pulls down the performance of the state in its overall performance with just 20 % citizen satisfied with the city being somewhat cleaner. Three cities were covered in the survey for Punjab and the state has done well in its overall performance. 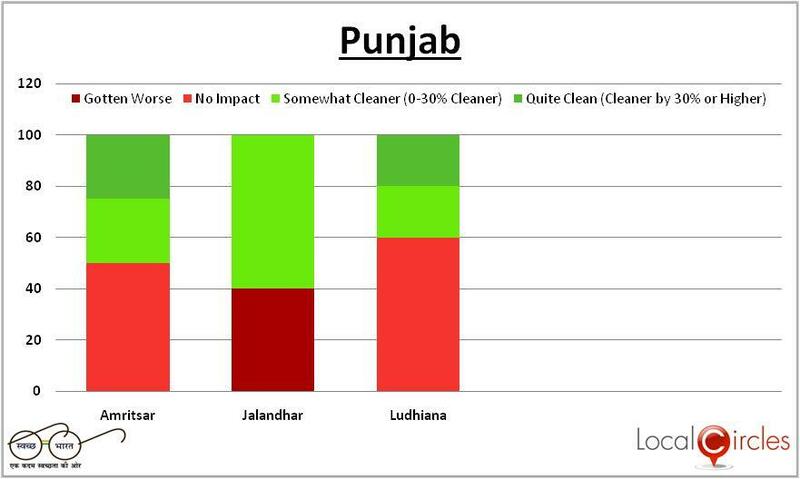 Jalandhar has 60 % of its citizens saying that the city is somewhat cleaner. When the majority of the citizen in a city say endorse it means that something is working in the city. Even Amritsar and Ludhiana do well with 50% and 40 % saying that the city is somewhat cleaner because of Swacch Bharat Mission. The average for the three cities crosses a majority and means that the state has done well for itself. Nine cities were covered in the state of Rajasthan and the best performer is the city of lakes Udaipur. 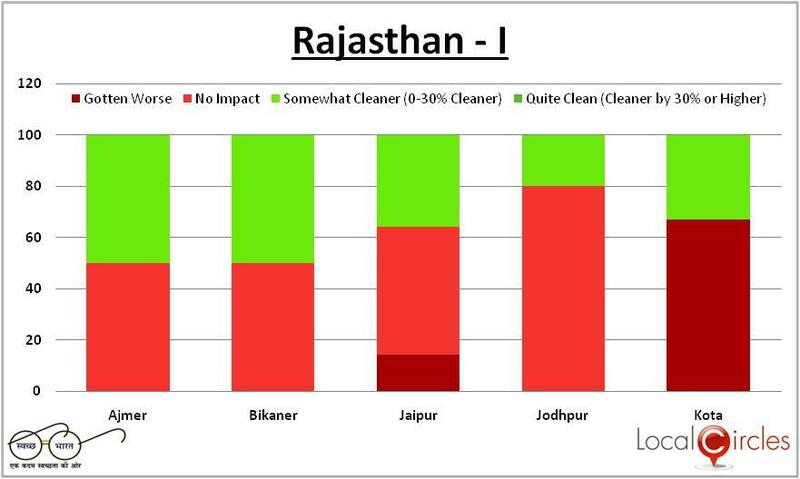 Almost 75 % of the citizens of Udaipur say that the city is somewhat cleaner due to Swacch Bharat Mission. The city attracts a very high percentage of foreign tourist and is dependent on it therefore it is good to see it perform high. Bikaner, Bharatpur and Ajmer are the other cities which do well in the state. The overall performance of the state falls as result of four cities including its capital city Jaipur. Eight cities were covered in the state of Tamil Nadu. 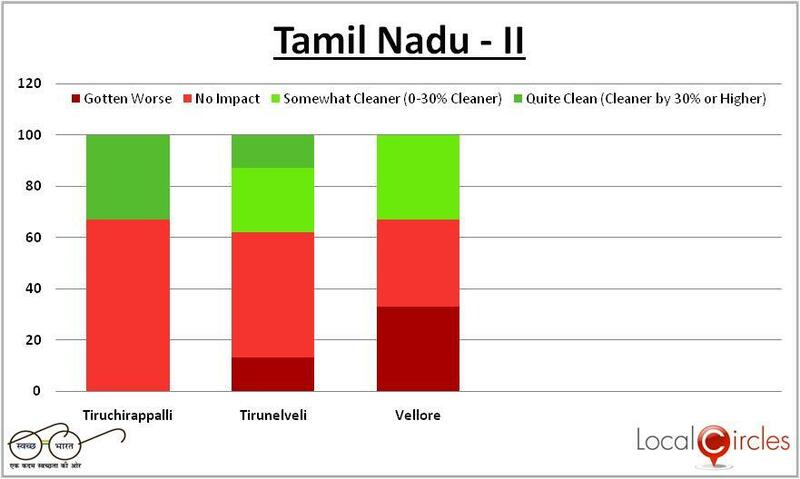 Small cities like Tirunelveli do much better with the Swacch Bharat Mission with 38 % citizen saying that the cleanliness has somewhat or quite clean, capital city Chennai on the other hand has 35 % citizen saying the same. Salem, Vellore and Madurai pull down the overall performance of the state. Salem citizens are especially dissatisfied and 40 % believe sanitation situation has become worse in the state. Similarly in Vellore 33 % citizens believe that things have gotten worse. This is an alarming statistic and shows that basic infrastructure in these cities in the states are seriously poor. Telangana is a new state though the two cities covered are the most populous and cosmopolitan in the state. Hyderabad and Secunderabad are twin cities and have seen a rapid expansion in population due to the tech boom. As a result it has a high level of citizens who are on the internet and smartphones. Both the cities show 26 % to 27 % citizen saying that they feel their city is somewhat cleaner. But at the same time 30 % citizens in Hyderabad and another 23 % in Secunderabad say that the city has gotten worse when it comes to cleanliness. Overall, according to citizens, the state has shown little improvement in cleanliness as a result of Swachh Bharat. Ten cities the maximum number were covered in the most populous state of Uttar Pradesh. Due to the number of cities some of the cities may have low number of respondents. Kanpur, Moradabad and Agra stand out among the cities as examples as citizens here 57 % to 67 % that is the majority of the citizens say that the city is somewhat cleaner or quite clean. Agra is a tourist city with Taj Mahal as a global attraction and it seems the administration has been working to make the city better. The Swacch Bharat Mission seems to have helped the local administration in driving the cleanliness agenda. Kanpur on the other hand is an industrial city but is home to activist citizens and if it is improving than there is much hope for the largest and most populous state in UP. 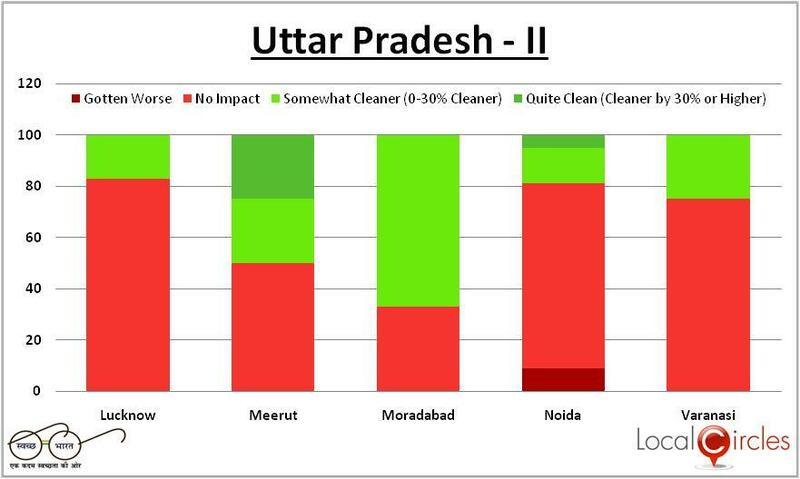 Moradabad scores high with 67% of the citizens saying that the city is somewhat cleaner the highest number in the state. The low satisfaction in capital city Lucknow and the seat of the government bucks the normal trend of capital cities doing well. 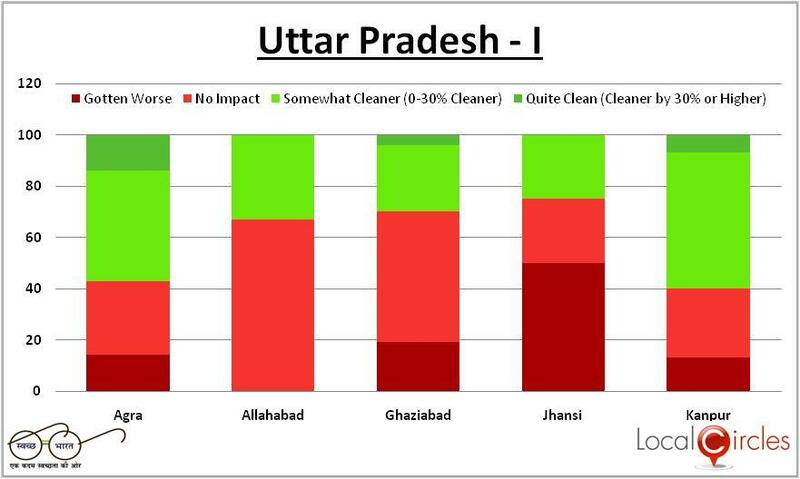 Just 17 % of the citizens of Lucknow say that the city is somewhat cleaner due to Swacch Bharat Mission. Three cities of Uttarakhand a hilly state were covered in the survey. Haridwar is the only bright spot in the state with 17% of the citizens there saying that the city has become quite clean and an equal number of 17 % saying it is somewhat cleaner. The capital city Dehradun does not score high and in spite of being the seat of the Government only 20 % say that the city is somewhat cleaner while another 20% claim that the city has got worse. Three cities in the state of West Bengal were covered in the survey with marginal improvement at the state level. However, Kolkata with the highest number of votes has approximately 49% citizens feeling no impact of Swachh Bharat and 12% citizens suggesting that things have gotten worse. 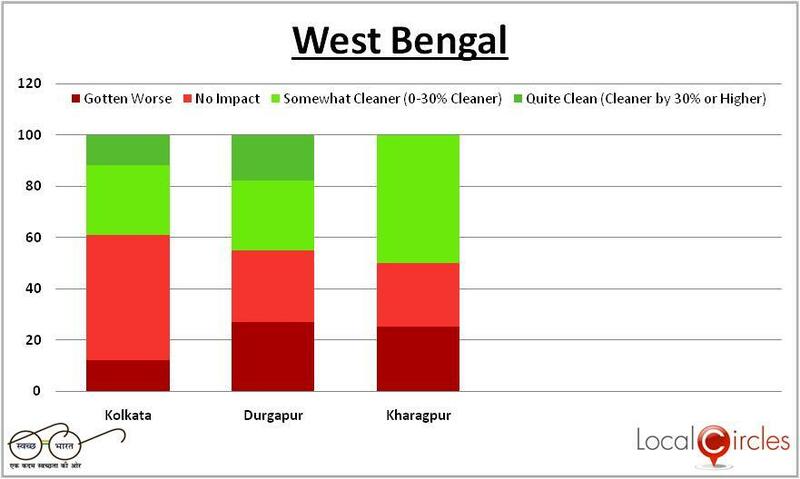 Kharagpur is the brightest spot with 50 % citizens there saying that the city is somewhat cleaner, but surprisingly 25% of the citizens also claim that the city has gotten worse. Swachh Bharat Online Citizen Communities are now available in over 100 cities of India. These communities allow citizens in these cities to get and stay connected for the cause of Swachh Bharat. The urban local bodies of these cities can access their respective city community to seek citizen inputs, run surveys, organize events like cleanliness drives, citizen feedback sessions etc on fingertips. These communities started by LocalCircles (www.localcircles.com) and Swachh Bharat Mission, Ministry of Urban Development in October 2014 promote participative governance in its truest sense.